It’s been more than eight years since Red Dead Redemption was released for the PlayStation 3 and Xbox 360, single-handedly catapulting Rockstar San Diego into the same conversations we had been having about Rockstar North for years. In the years that have passed, the love gamers had for Red Dead Redemption has never diminished, with a sequel eagerly anticipated and wished for. Now it’s finally time to return to Rockstar’s Wild West and within it we found a beautiful world beyond anything else we’ve seen before but held back by poor controls and a story that is so slowly paced that is begins to wear out its welcome. Set an unspecified number of years before the events of Red Dead Redemption, you take control of the Van der Linde gang’s right-hand man Arthur Morgan, a seemingly amoral arbiter for your chosen playstyle. 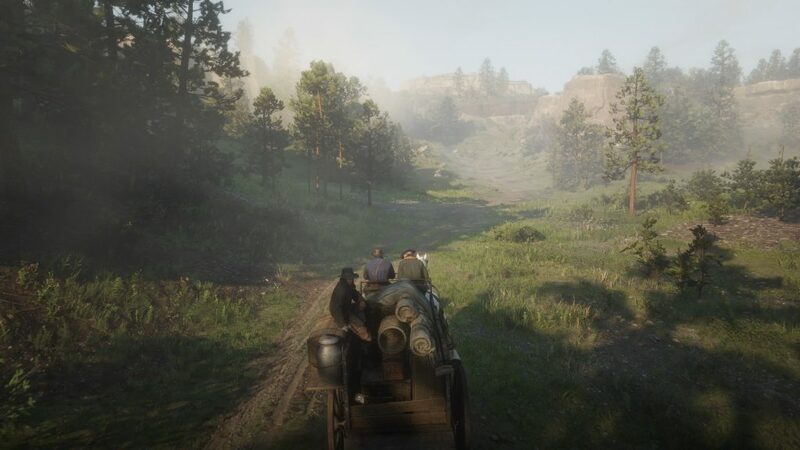 This sense of character is quickly changed as the story progresses, as Arthur is fleshed out through missions, idle chatter with other gang members and your own actions in the open world. Despite the initial impression, Arthur’s character is filled with nuance, as he takes a surprisingly philosophical view on the situations occurring around him and reflects on what they mean for him, his companions and their chosen way of life. What results is the best protagonist found in a Rockstar game to date, one of the best in games to date, and an incredibly engaging view into the game’s world and story. While Rockstar have often created fun characters, they have largely barely scratched the surface on true character development, and Arthur’s growth as a protagonist and a human left me genuinely caring about him long before the game’s end. The supporting cast is similarly well written and engaging, with characters like Sadie Adler and Charles Smith being the standouts in a large cast of characters. Watching these characters grow and their relationships develop, as they are hit with hardship after hardship creates a human-centric plot that drags you in and keeps you eagerly wanting more. It is this character development that forms the base for Red Dead Redemption 2’s plot and provides a certain amount of goodwill towards ignoring the story’s failings. While the characters and story itself are fantastically written and highly engaging, they are also overly verbose and time consuming. Most missions start with a minutes-long ride to the location where the true beginning of the mission is. This is almost necessary, as on the way there large conversational info dumps occur, giving you context for the mission at hand and also showing important character interactions. However, these conversations are often interspersed with long silences, with the next part of the conversation not triggering until you have reached a certain part of your journey, so that the conversation doesn’t prematurely end, or so the journey’s end doesn’t become filled with silence. These sequences could have easily been contained within significantly shorter cutscenes and then a jump to the mission’s true starting location, and instead just seem to pad out the length of the story – a padding it certainly doesn’t need. 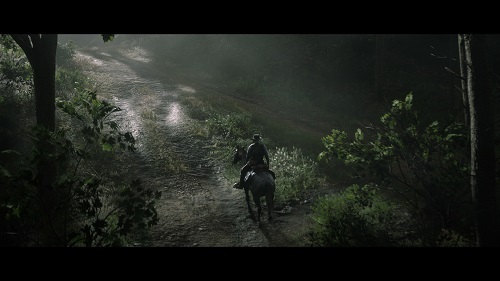 In fact, Rockstar themselves seemingly realised there were better ways to perform these sequences, as once you get into the last couple of chapters you begin getting automatically jumped forwards after a short initial conversation, instead of spending time slowly riding towards the true mission beginning. As a whole, there is one word I would use to describe Red Dead Redemption 2– slow. This isn’t meant as an insult to the game, but more as a general feeling and design choice. 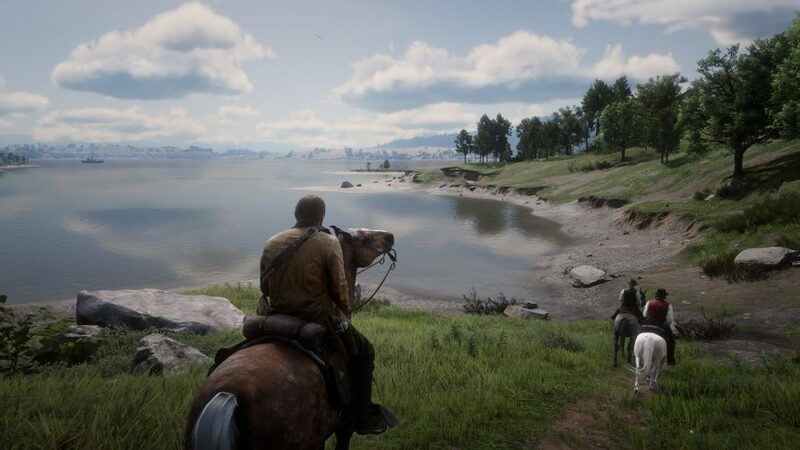 Given that you’re riding horses from location to location, as opposed to driving sports cars and flying jets, it makes perfect sense that there would a certain slowness to the game, and it’s this slowness that allows you to truly appreciate just how beautiful the world is in the game. Playing the game on Xbox One X it is plain to see that Red Dead Redemption 2 is the best-looking open world game I have ever seen, and is almost certainly one of the best, if not the best, looking games ever. The level of detail seen in the world is completely unmatched in games today, from the drifting of snow, to the thick foliage of the forests, and further still the individually leafed vines creeping over rundown buildings in the swamps. The weather effects, especially the slowly drifting mists and fog, randomly occur and are a sight to behold. Character models are incredibly detailed, as are the wildlife of the world, and the towns are architecturally diverse. Consider that all of this also comes with a native 4K resolution and a rock-solid technical performance, and it’s easy to say that Red Dead Redemption 2 is a technical and graphical marvel. This level of detail continues throughout the game’s design, and most specifically holds true when discussing the animation within it. Almost every action within the game has had a specific animation created for it, leading to a world that is easily to fall into and believe is real. Character gaits completely change depending on the terrain you’re traversing, as well as based on its slope and how fast you’re travelling. Characters react realistically to outside forces, like getting knocked back by attacks and reacting to the temperature of the world around them. On the flipside, the large number of character animations also work to deliberately, and sometimes frustratingly, slow the game down. Skinning animations take between 5 to 10 seconds and are unskippable, but it’s the looting animation that is truly frustrating. Given the number of outlaws you take out on a routine basis – we’re talking anywhere between 10 and 40 in a standard story mission shootout – having to go through a 3 second looting animation for every single body you loot is just annoying and time consuming. The longer the game went on, the more I began simply ignoring the bodies of my foes and just relied on making money via other means and purchasing ammo instead of trying to scrounge around for it. The world’s wildlife is similarly detailed in their animation, with different motions depending on terrain, threat levels and if they have been hurt. The real treat though, comes in the detail given to the game’s horses. Horses are hardly new to games, but their behaviours and animations are regularly overlooked by designers and we basically end up with glorified transport, as opposed to living and breathing creatures. Horse’s movement animations are utterly on point, flowing perfectly from a walk, to a trot, to a cantor and then a gallop and they react realistically to outside stimuli as they’re going. The level of detail goes so far as to the breed/training of the horse, with different horse types reacting differently to situations. A race or standard trained horse will whinny and shy away at gunfire or when a critter gets under its hooves, but a warhorse will largely ignore gunfire and simply trample over anything unfortunate enough to end up underhoof. These all come together to create the most realistic horses in a game to date, which is fantastic considering you’re going to spend the vast majority of the game on or around them. While so much of Red Dead Redemption 2’s overall design is amazing, there are a couple of critical areas that bring it back down to earth. The first of these is the game’s controls. If you’ve played a Rockstar game in the last decade, you’ll likely already know exactly how the game controls. Character controls are weirdly floaty, with characters turning on a dime and the slightest shift of the analogue stick is liable to send them careening off path. The control scheme continues another frustrating Rockstar tradition – mapping run/sprint to a face button on the controller. This causes you to completely lose manual camera control while sprinting on foot, which is an annoyance that other games and developers solved a decade ago. Shooting controls are the same incredibly auto-aim heavy ones that have been featured in Rockstar open world games since the last generation. I personally love being able to snap to enemies and quickly take them out, but only because the standard shooting controls without them are incredibly slow and unwieldy. Even with some manual tinkering, I couldn’t get them to a point I was happy with. As far as its controls go, Red Dead Redemption 2 feels like a game from the last generation of consoles. The worst part of Red Dead Redemption 2’s shooting controls feeling so bad is how often you’re going to be engaging with them. 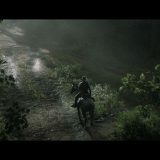 While Red Dead Redemption 2 has such a strong story and strong characterisations, these aspects often take the back seat in missions, with most comprising of some form of wave-based shootout. I’ve personally heard these sequences likened to Whack-a-Mole, and it’s totally true. You wait for an enemy to pop out from cover, snap to them and take them out with 1-3 shots depending on your weapon. Do this to 3-10 enemies, move up a few metres to the next lot of cover and rinse and repeat. 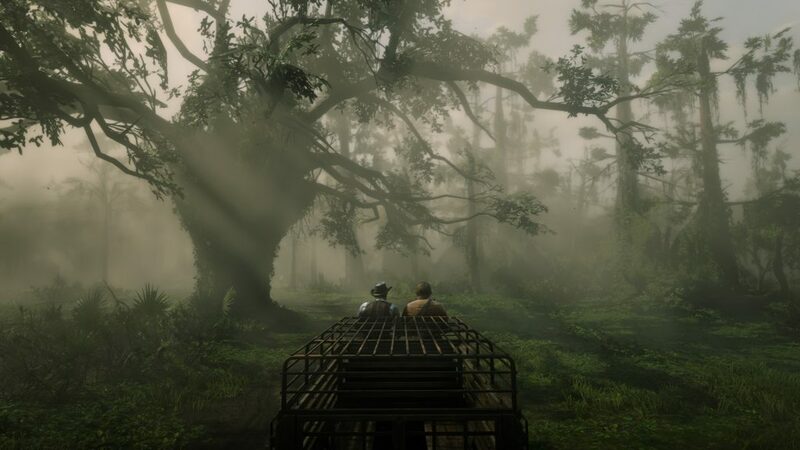 The worst part of this is that beyond these shoot outs, Rockstar San Diego showed that they can create some really memorable missions and have some interesting design ideas. Silently sneaking into an enemy base to retrieve a valuable item, tracking and hunting a legendary beast and shooting enemies below from a hot air balloon are some of the moments I liked, but it was the missions that just focused on character interactions that really played to the games strengths and were my favourites. I would have loved to have seen more missions focusing on those moments, as opposed to having another shootout with what seems like half the population of a town. For many, the real appeal of an open world game like Red Dead Redemption 2 is the freedom to play the game the way you want and experience the content in the order you want. This is another place that the game both shines and falls over at the same time. While in the open world you’re free to interact with the world in almost any way you want, and there’s no shortage of things to keep you entertained. 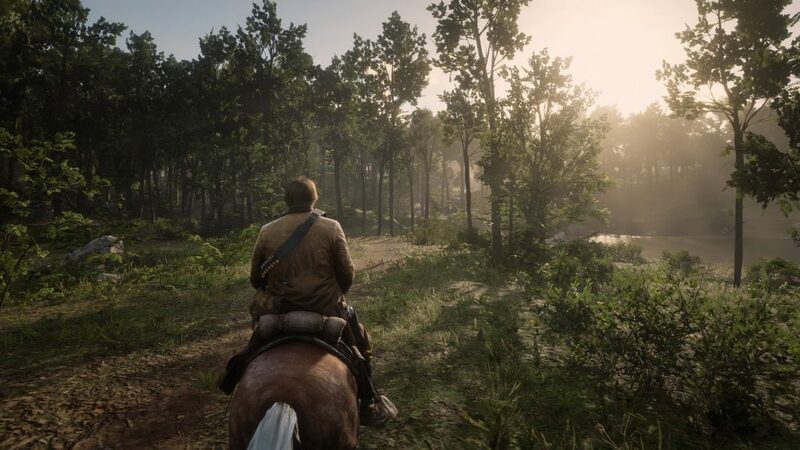 Bounty hunts, poker, fishing, hunting, breaking wild horses, random strangers and side quests are only some of the activities you’ll find across the open world. There are also totally unscripted activities you can take advantage of as well. Want to rob that carriage? You can. Want to rob that train? You can. Want to steal that horse? You can. Want hogtie an enemy and drown them in a lake? You can. There is an expanse of content to experience in Red Dead Redemption 2 and you can choose how you go about experiencing and role playing it. You always have the option to shoot first, but you can also try to defuse situations using words instead of guns. It’s certainly refreshing and something I wish more games did. This freedom, however, doesn’t apply to the story of Red Dead Redemption 2. While the open world allows you to explore and experience at your leisure, the campaign forces you into strictly scripted missions with forced paths that you can’t deviate from in the slightest. This isn’t to say that the story removing player choice is an issue, but a mission automatically failing because you went 10 metres from the designated critical path is a problem. This even applied to verticality in shootouts. Want to climb onto that roof next to you to make use of the higher ground and your scoped rifle? The other characters in the mission quickly start screaming at you about abandoning them and unless you quickly get back down, the mission will fail. Want to take a shortcut across a field to get to an objective faster while riding with a companion or hit an object and fall too far behind while simply going to the next objective? Get ready to restart from the last checkpoint. I had to restart more than one shootout after enemies outside of my field of view abruptly killed my companion and on a couple of occasions automatically failed after my character got hung up on the geometry and didn’t mount up fast up or fell behind a caravan of companions. Even most stealth missions are completely scripted, with your only option being to follow a companion and their orders, else you risk automatic failure and being booted back to an unspecified checkpoint. For a game that offers such freedom at every other turn, the strict control during the story is utterly unwelcome and frustrating. In the end, Red Dead Redemption 2 will more than meet the expectations of fans who have waited so long for it. It tells a surprisingly philosophical and poignant story, anchored by an incredibly well written and character cast of protagonists and supporting characters, even if it feels overly long and written. The world is amazing, with the best graphics to date from an open world game, immensely detailed animation and rock-solid performance on Xbox One X. The poor controls and frustrating lack of freedom during story missions stop the game short of reaching the heights it could have, but Red Dead Redemption 2 is no doubt one of the best games of this generation and one that I highly recommend playing.